Hi Friends: Today's card is a quick stamped image colored with Copics and layered onto patterned paper. I picked the papers, first, then colored the image based on the paper colors. I stamped the image (from the Cardmaking and Papercrafts free set Oscar The Owl and Pals) with Memento Tuxedo Black ink, then colored it with the Copic markers listed below. I die-cut the image and the background panel, then used foam squares to layer them onto MME patterned papers. I added a bit of bling to the dots on the fox using a Stardust glitter pen. I finished the card with the sentiment and some baker's twine. Thanks for taking a look. Have a great day! 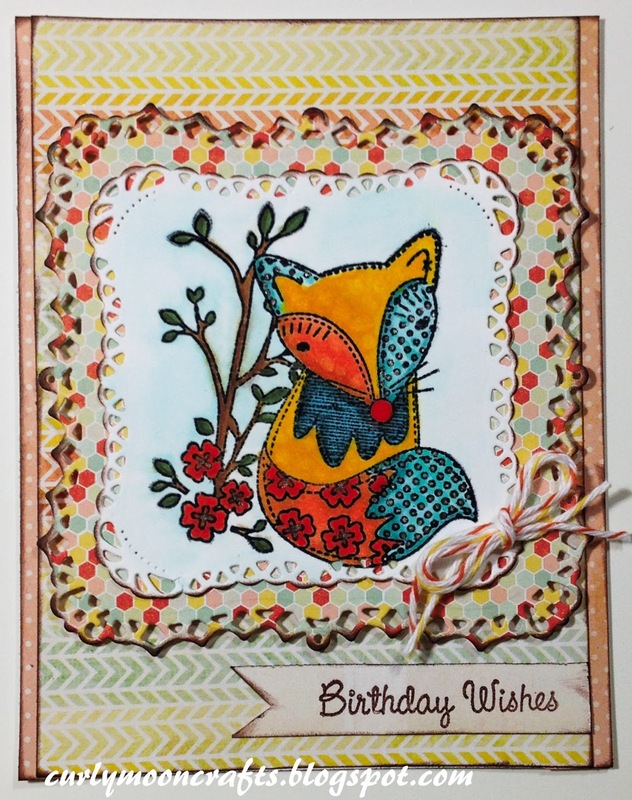 Patti, I adore your little patchwork fox, perfect for our challenge this week! Thank you so much for sharing him with us at the Simon Says Stamp Wednesday challenge! Such wonderful colors and beautiful image! Thank you so much for playing along in my Critters and Creatures Linky Party, so sorry I am just now commenting, didn't realize there was a whole other page of entries.